Description: Jessie has a lot of friends who are fashionistas, but following the rules can be so boring and that's why she decided to take a little risk and try on the rock star style. First, prep her skin with soothing masks, get rid of all imperfections and correct her eyebrows. Second step apply a bold makeup look to match her new style. 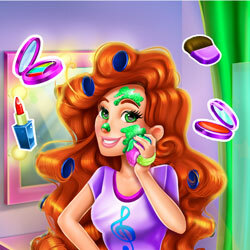 And then get ready for the final stage where you can dress her up in a bold outfit to finish her makeover.